The art of mastering maturity and effective interpersonal encounters taught by someone who is a little too familiar with the concept of melodrama. Originally published by The Interrobang. Hey there! Thanks for dropping by PSYCH Your Mind! Take a look around and grab the RSS feed to stay updated. See you around! Vol #1, Col #17: Guilty as Charged! The other day a girlfriend of mine texted me in a panic. Though her initial message merely read, “Hey what’s up?”, I knew immediately (call it a hunch, must’ve been a consequence of our recent discussion on gut feelings) her interest in contacting me went far beyond a casual check-in. It didn’t take long after my prompt reply for her to proceed in sending me an uncensored description of all of the wrongdoings she had committed recently, followed by profuse apologies and a request for forgiveness (out of fear she’d lose me as a friend) as though I were some divine entity. I explained to her while I did not in any way, shape or form condone her actions, I was in no position to judge another person as we all (including me!) make mistakes. Moreover despite her unfortunate choices as of late, I relayed to her, as ironic as it may sound, that the horrible feelings she was currently battling with were actually a good thing. After all, if she could commit atrocious acts on a regular basis without inspiring extreme feelings of remorse shortly thereafter, she’d fit one of the psychological profile characteristics of a serial killer (ie: lack of a conscience) and accordingly, I’m not so certain I’d feel safe enough to be her pal! That of course is the irony of guilt: it makes you feel absolutely wretched, but you know what? That wretchedness is valuable as it acts as an instigator for growth, learning and yep, you guessed it, psychological maturity. 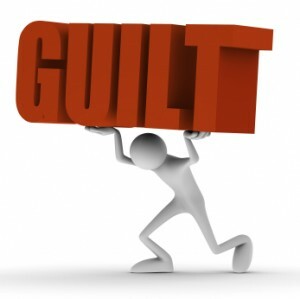 According to Martin Hoffman, Professor of Clinical Psychology at New York University, “the guilt response” is composed of both an emotional and cognitive element and is activated upon the acknowledgement that one has participated in an action that clashes with his/her self-concept in a detrimental capacity. Important in this definition is the understanding of how one’s emotions (ie: feelings and sensations) interact with one’s cognition (ie: logical thought processes). As cognitive psychologist Piaget theorized, the ability to think about one’s actions abstractly and hypothetically is a capacity that does not typically develop until late childhood. As a consequence, the internalization of a sense of personal “morality” (ie: the capacity for forming judgments about what is morally right or wrong, good or bad, in terms of how said actions will affect others) cannot begin to form until around the same time period, at the very earliest. The teaching of morality and responsibility then (at least in the initial stages) relies upon the behaviourist’s “primitive” model of reward/punishment. Essentially, if we are rewarded for “good” deeds even if we do not have the psychological capacity to understand that they are “morally” good, we will continue to commit them purely for the reward. On the other side of the equation, if we are punished for negative outbursts, equally it is presumed we will no longer be compelled to act in said fashion. Alas, if only it were that easy when we become grown-ups! As we age, it seems the grey area between the black side of “wrong” and the white side of “good” expands, often leaving us in situations fraught with moral ambiguity. Throw the media’s influence, legislative and religious hypocrisy along with various cultural factors into the mix, and you’re left with more confusion that clarity. 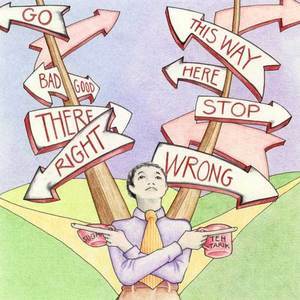 This however is NOT a piece about morality – that’s something you’ll need to figure out on your own (ie: what’s right for you) as you encounter various decisions and dilemmas throughout your life. Often times, situations, particularly of the heart, are powerful enough to act as the catalyst for an entirely new moral compass. What I do hope you take away from this piece however is as follows: MATURITY IS the ability to admit you’ve made mistakes, the willingness to accept responsibility for any consequences that may result from your actions AND the desire to make amends NOT hold juvenile grudges. In life, sometimes there are lessons that necessitate multiple “courses” before we fully digest the message. Often times, people continue to “reoffend” despite being cognisant of the Pandora’s box they know they’re going to open. As is the case with many, this apparent lack of foresight is typically accounted to one of two things: a) “tunnel vision” (ie: focussing too much on one’s immediate often superficial self-serving desire for thrills as opposed to long-term meaningful gratification) OR as was the case with my girlfriend b) a lack of a concrete and positive self-concept; something we’ll delve into more next week! Given today’s globalized and technology-driven marketplace, our connection to diverse human groups, from sea-to-sea, is undeniable. However, our imprint as a species does not merely end there. The air we breathe out, the sustenance we consume, the habitats we build and even the energies and moods we emit further influence all other forms of life inhabiting this planet we call home. In other words, no creature or species lives in autonomous isolation (humans are no exception), and as we discussed last week, life on earth is cyclical and deeply intertwined. Now let me make clear my preface is not meant to serve as an argument for environmentalism nor karma, I’m simply trying to establish that the process of developing a psychologically mature mindset goes beyond simply contemplating “the self”. One must too learn his/her “position” in the natural world and how that “position” influences other forms of life within his/her immediate AND/OR peripheral surroundings. In doing so, one is able to learn how to evaluate and react to situations after a thorough and objective investigation of multiple perspectives. In other words, a key to psychological maturity is mastering the art of “being considerate”. As psychology was borne from the amalgamation of one part philosophy, it only makes sense that we turn to the concept of Sartre’s existentialism, this week, in order to gain insight into the above outlined concept. Though Sartre made no qualms about the fact he was an atheist, ironically the crux of his treatise can be summed up by the Golden Rule: “Do unto others as you would have them do unto you,” (Matthew 7:12, King James Bible). Specifically, because Sartre did not believe a divine being was ultimately predetermining our actions as well as our “essences”, he placed the onus on individuals to act responsibility AND to take responsibility for how they act. More than just that however, he felt that humans determined their own morality through their choices, in that an individual’s participation in an activity symbolized their condonation of that same activity. In simpler terms, if I choose to be rude toward others, I have no right to be offended if I receive the same treatment in return, as my original behaviour determined I considered it morally “a-okay” to act in this manner. To make reference to yet another popular biblical verse: “you reap what you sow,” (Galatians 6:7). But as developmental psychologist Lawrence Kohlberg points out in his “Moral Stages of Development”, a true sense of personal ethics and responsibility is not merely defined by attempts to ‘play nice’ in order to avoid reprisal. Those who have accomplished the highest stage in Kohlberg’s moral development scheme known as “post-conventionality” believe in adhering to an unwritten social contract that mandates “working toward the benefit of all.” Of course, this high aim is only possible if we all collectively agree on upholding the same values…Judging by our past and ongoing cultural clashes, I don’t see this happening anytime soon. HOWEVER, that does not give you an excuse not to at least practise basic human decency, which I’d like to point out is transferrable (and appreciated) across human societies. Importantly, Heath points out that one of the most profound ways humans of all ages learn is through “modelling”. I hate to sound like a broken record, but if you want others to be considerate toward you, the first step is learning to partake in this behaviour yourself. Before any of you start feeling as though I’m instructing you to carry the weight of the world on your shoulders, I assure you I nor does anyone else expect you to become the next Gandhi or Mother Teresa. The lesson here is NOT about trying to solve all of the world’s problems or attempting to spread “goodwill” across the globe (though I definitely applaud anyone with said ambition). Instead, what I’m trying to impart is that beyond understanding yourself, what makes you tick and owning up to all of your strengths as well as faults, it’s essential to recognize how you affect others, moreover learn how you can maximize POSITIVE effects. Look. Listen. Learn. Live. Vol #2, Col #6: Is Time Really On Your Side?